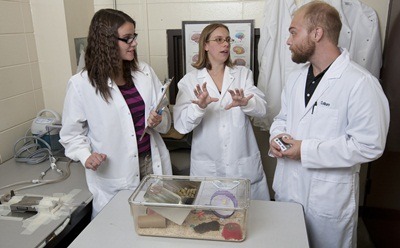 Psychology Professor Angela Grippo (center) in her laboratory with student researchers Rachel Murphy and Wil Colburn. In the laboratory of award-winning researcher Angela Grippo, mouse-like creatures known as prairie voles are getting an extreme makeover – habitat edition. Nothing too fancy, mind you – a running wheel, chewy toys, tinfoil balls and furnishings that include a paper towel roll and miniature igloo for cozy hiding places. By enriching the living environment of the prairie voles, the NIU psychology professor and her team of student researchers aim to produce significant health benefits in the animals – and demonstrate ways to prevent and treat mental health and cardiovascular diseases in humans, too. Grippo’s new multi-year research project investigating links between the environment and health is being funded by a $354,000 grant award from the National Heart, Lung and Blood Institute, a division of the National Institutes of Health. The research is of interest to health officials worldwide. In humans, depression is the top cause of disability and quality-of-life problems. The prevalence of depression in patients with coronary artery disease is about five times that of the general population, and in all developed countries, heart disease is the No. 1 killer of both men and women. Grippo’s work has been getting increased attention. 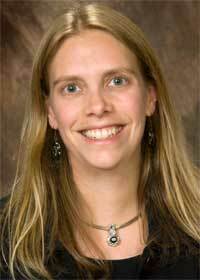 This past summer, the American Psychological Association presented her with its Award for Distinguished Early Career Scientific Contribution to Psychology. The APA cited Grippo’s use of animal models and sophisticated behavioral and neuroscience methods in advancing understanding of the connections among depression, stress and physical disease in humans. Prairie voles wouldn’t make for good pets – their natural instinct is to bite. But the rodents do make for excellent animal models because they exhibit human-like social behaviors, typically mating with the same partner for life, raising offspring together and forming strong family bonds. Previous studies by Grippo demonstrated that when these bonds are broken and voles become isolated, the animals show both depression and anxiety behaviors, exaggerated responses to stress and risk factors for heart disease. “Our research with prairie voles is directly relevant to the emotional and physical health of humans,” she says. “In people, emotional and cardiovascular health is intimately linked to social experiences. In humans, the environment can be enriched through physical exercise, activities that involve manual dexterity and activities that engage cognitive areas of the brain, such as crossword puzzles or word games. Research findings aren’t the only objective of Grippo’s new grant, however. Her laboratory also serves as a unique training ground for a large contingent of NIU students. “A primary goal of the new grant is not only to better understand important interactions among emotion, stress and the heart, but also to provide unique learning experiences for both graduate and undergraduate students at NIU,” Grippo says. Rachel Murphy, a sophomore psychology major from New Lenox, says she is learning lessons that aren’t found in the textbooks. Junior psychology major Elliott Ihm of DeKalb believes his experiences in Grippo’s lab will help him in graduate school. Other student’s in Grippo’s research group include undergraduates Ashley Dotson, Nalini Jadia, Rachel Schultz and Andrew Wegner, along with graduate students William Colburn, Neal McNeal and Joshua Wardwell and postdoctoral researcher Melissa-Ann Scotti. Twenty other students have participated in Grippo’s research in past years.